Updated: 9:22 p.m. | Posted: 8:08 p.m.
Gov. 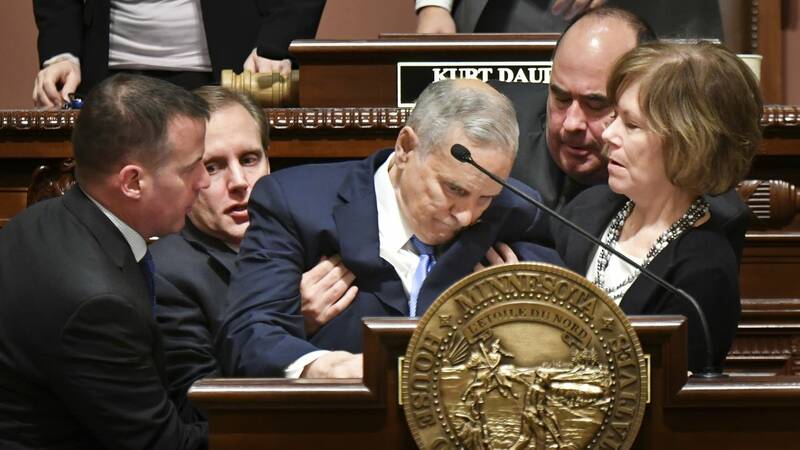 Mark Dayton collapsed during his State of the State address Monday night, ending the speech early. A news release from the governor's office Monday night said the governor "quickly recovered, walked out of the Capitol and returned home." Several State of the State address attendees, including Lt. Gov. Tina Smith and Secretary of State Scott Simon, rushed to Dayton's aid as he collapsed. Sen. Scott Jensen, R-Chaska, a doctor, was one of two medical professionals in the Senate who responded immediately when the governor fell. He said the governor was in stable condition shortly after the event. Sen. Dan Schoen, who is also a paramedic, was among those who went to Dayton's aid; he said Dayton was acting normally within 20 minutes of the collapse and poking fun at himself. Eric Dayton, the governor's son, said on Twitter that he was with his dad and "he's doing great." Reporters on the scene observed Dayton joking as he walked off. Dayton, 69, had paused his speech to take a drink of water. He seemed to waver a bit, and then collapsed, apparently hitting his head before falling to the floor. He revived and left the chamber on his own. Republican Senate Majority Leader Paul Gazelka moved to adjourn the speech. The release from Dayton's office said that EMTs "performed a routine check" once he returned home, and that "he is now spending time with his son and grandson." The governor fell about three-fourths of the way through the speech, as he laid out the opening salvo in a brewing battle with Republican legislative majorities over where to bring the state after November's elections, including his proposal for a state-run public health care option for all Minnesota residents. 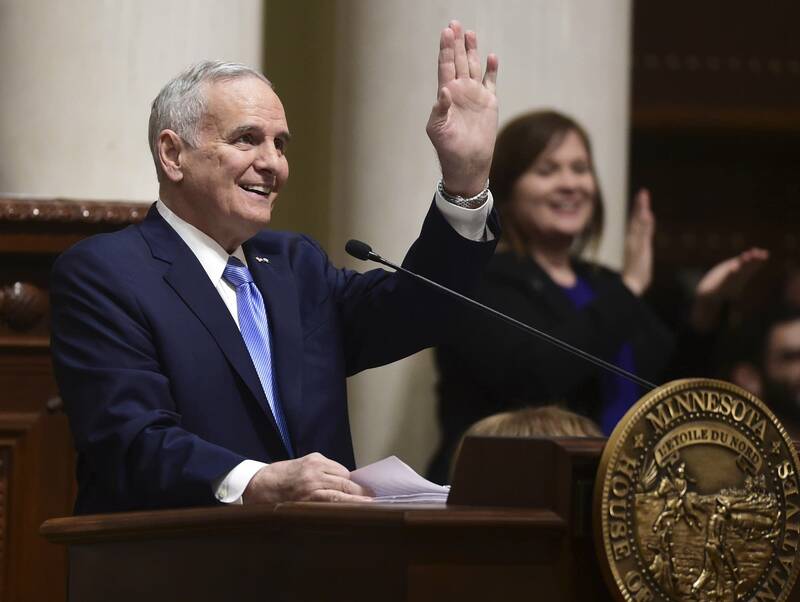 Dayton was hospitalized last January after fainting at an event. He's had two spinal surgeries in the past four years and has often used a cane. House Speaker Kurt Daudt and fellow Republican legislative leaders declined to comment on Dayton's speech, instead only offering their prayers for his health and safety. "That's our whole focus right now, just praying for our governor," Gazelka said. The governor turns 70 on Thursday. He intends to present his 2017 budget late Tuesday morning, as planned, according to the release from his office Monday night.